Did someone say road trip? 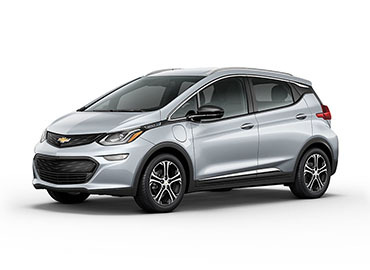 With up to 238 miles of pure electric range on a full charge, Bolt EV can take you anywhere. Just download charging apps on your smartphone to find charging stations along the way. Did you know the average daily commute is about 40 miles round trip? With an EPA-estimated 238 miles of range on a single charge, you can get through the day – perhaps even three or four days – without needing to plug in. Bolt EV is revolutionizing the way you drive electric cars. Go from your everyday route to extracurricular activities without missing a beat. You can even take a road trip. Seats easily fold down for 56.6 cu. ft. of maximum cargo volume.† Thanks to 60/40 split-folding rear seats, you'll have the flexibility to transport larger-shaped items whenever you need. This available technology allows the rearview mirror surface to double as a video screen, providing the driver with a wider, less obstructed field of view behind the vehicle than a traditional mirror. This available advanced feature monitors how close your vehicle is to the vehicle in front of you. If the system determines that a front-end collision with a detected vehicle could occur, it alerts you of a potential crash.